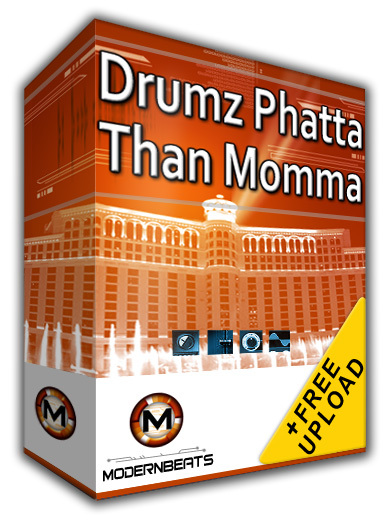 Drumz Phatta Than Momma Drum Samples - 15 drum soundsets in a single download 53% OFF!!! DOWNLOAD 2,800+ Drum Samples 50% OFF with Bonus VIP Drums, Music Contracts Vol1, 10 Music Tips, + Free Upload! Download Drumz Phatta Than Momma (15 Drum Library Collection 50% OFF) - Featuring 15 GRAND drum sound sets in one LARGE package (Over 2,800 drum samples!) at a 52% discount: DRE-mendous Drumz 1, 2, and 3, Timbalicious Drumz 1, 2, and 3, Da Vinyl Factory Drumz 1, 2, and 3, Intergalactic HipHop Drumz 1 and 2, Telephone Filtered Drumz 1 and 2, and Club HipHop Remix Drumz 1 and 2. Drumz Phatta Than Momma also includes 7 auto-loading software sampler formats in one: Halion (.FXP), EXS24 (.EXS), Kontakt (.NKI), Battery (.KIT), Reason (.SXT), Soundfont (.SF2) Plus, WAV format (.WAV) Compatible with FL Studio, Fruity Loops, Acid Pro, Cubase, Logic Pro, Reason, Sonar, & Pro Tools! Purchasing the Drumz Phatta Than Momma Collection gives an unheard of number of drum sounds for your favorite software sampler! Does 1,080 kicks, 900 snarez & rimshots, plus 900 percussion soundz sound appetizing?!?! ...And not only are you purchasing quantity, but QUALITY. Our Sound Sets contain ONLY contemporary up-to-date production toolz for today's competitive Top40 / HipHop producers. Rest assured, you get what you pay for.